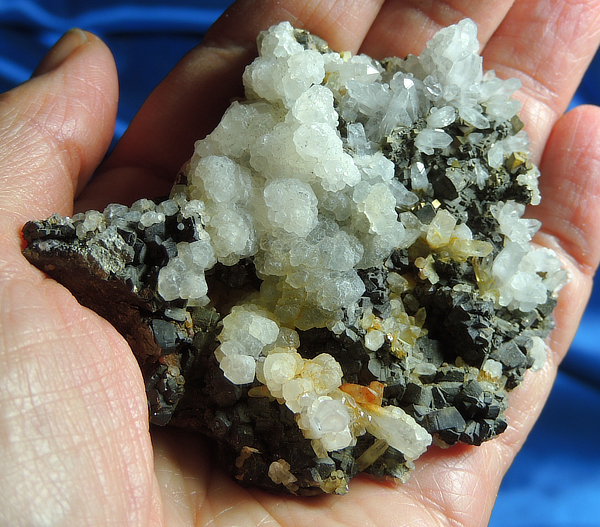 This is a wonderful and sprawling little cluster from Kosovo, 4.2 oz and 2.8” by 2.4” by 0.8”. She is a layer of little quartz crystals, most at least partially cloaked by moonglow calcite and all sitting atop chalcopyrite! If you look at the base, the little crystals of calcite continue there, but it is also where the chalcopyrite shows its glittering colors. You will be amazed at her beauty and her energy! Calcite is one of the most amazing crystals, largely due to the diversity of its various forms. Calcite is a Change Master, adapting, including, expressing. This Spirit, in particular, shows the change she has undergone, growing with other crystalline species and adapting her surface to suit. She helps you deal with change and understand its necessity both in your physical life as well as your Spiritual expression in this incarnation. Change is a difficult thing for a lot of us – we fear and dread it. While we don’t like the rut we are in, it is still our rut, we are comfortable in the predictability of it and getting out of it only seems like a nice idea. Well, this Spirit allows you to see the rut for what it is. She gets you unstuck and into positive change that will help give zest and color to your life. Her chalcopyrite shows you the sparkle and color while her quartz acts like little mini-antennas to sent her energies outward. You will find the whole concept of change to be welcome now – a perfect message for the new year!